“In most materials there is a pattern in the [crystallographic] orientations which are present and a propensity for the occurrence of certain orientations caused firstly during crystallization from a melt or amorphous solid state and subsequently by further termomechanical processes. This tendency is known as preferred orientation or, more concisely, texture” (Randle & Engler, 2000, p.3). Here, we should notice that while texture might refer o the structures of designed wholes, they do at the same time refer to qualities fundamentally situated in the properties of a specific material at hand. 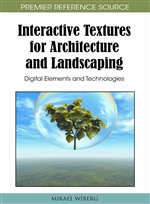 In this chapter I present a number of different examples of textures (see e.g. Figure 27 for an example) in order to demonstrate the importance of textures and how we can use textures to e.g. express artistic ideals, create whole-part consistency, and draw attention to different areas of our surrounding. The pictures below show three such examples of (physical) textures (Figure 27). The first example shows a concrete wall in which round empty spaces of air are working together with the hard, intense concrete material in the creation of a wall structure that is not only functional to separate this space from the rest of the building to form a room, but it is also a piece of art that immediately draws some attention to it from any visitor to this public lecture hall in Sweden. The second example is from the ICEHOTEL in Jukkasjärvi in the far north part of Sweden. Here, the architects and designers have worked with the ice, the light and the darkness as raw materials in the creation of an entire ice hotel. The texture of this environment is both welcoming and mystique at the same time. A texture capable of communicating the spirit of raw natural materials through careful design and architecture of a space created out of exactly those basic elements in nature. The wholeness of this space forms a wholeness or texture in which the different parts scaffold each other in a material orchestration of the far north and the exotic wilderness in Sweden. Finally, the third texture used as an illustration of textures here is also a picture from ICEHOTEL in Jukkasjärvi, Sweden. Here, it is not the interplay of the wholeness that creates the texture, but rather the concistency of the rectangular squares of ice forming the wall structure of the interior at ICEHOTEL. “Textures” is an interesting notion since it deals with surface and raw material at the same time. It is in a sense simultaneously about the appearance and the essence of a material. In a broad sense, this book is about these new textures and how they occupy, constitute and enable our everyday lives. I see these new textures, which partly are created through the adding of computational power, as visible signs of an emerging interaction society (Wiberg, 2004), or if formulated in another way, as an “Interaction grid” laid out across our society, geography, our built environments and our social rooms. Computational materials are not only the physical hardware or the logical software, but also the services that these fundamental cornerstones of computers enable. As such, digital services adds an interesting philosophical dimension to the creation of new textures in that such textures can be made from physical and digital raw materials, but also partly realized through the adding of a digital service to the texture. In those cases, the texture might not be equally easy to discover visually as in the case with the train station construction site. Still, a skilled person in the area of interaction design or interactive architecture should be able to “read” the details of such new textures in which e.g. devices, services and physical representations are heavily intertwined. From my perspective, these are the building blocks of the modern textures that any designer, architect or artist will deal with in a nearby future. And from my perspective I like to think about the enabling character of these new textures as a wholeness in terms of an interaction grid. This interaction grid might be physically manifested in physical objects but a huge part of this grid is about digital materials including e.g. online resources, storage, processing power, information flows (including the whole range of solutions from e.g. secure data transactions to open RSS-streams), communication sessions, functions, algorithms, and various representation techniques.